Hand-forged by a century-old Dutch family business, this multipurpose garden tool will last a lifetime. 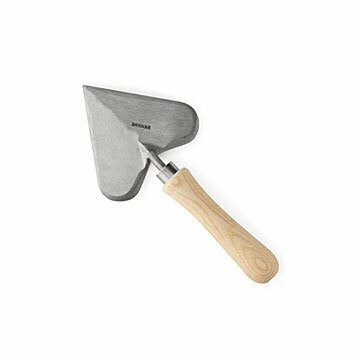 Serious gardeners will fall in love at first sight with this heart-shaped trowel. With its sturdy, stainless steel blade and ash wood handle, it's ready to commit to a lifelong relationship. The large head makes short work of breaking and turning soil, digging out stones, and leveling beds. The sharp tip cuts easily through even compacted earth, enabling gardeners to precisely place bulbs, seedlings, and small plants. We can't think of a better way to make love grow. Comes in a giftable cotton drawstring bag. Hand-forged in the Netherlands by Jaap Sneeboer and Family, who've been crafting fine garden tools for four generations.